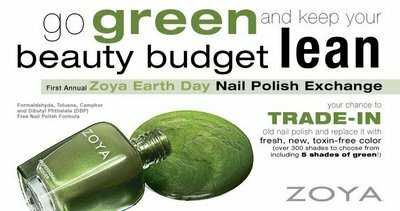 in case you haven't heard, Zoya is doing their annual "polish exchange" program right now, effective from april 22, 2010 to june 30, 2010. the details are on their website HERE but the gist is that you can exchange old, empty, or just plain ugly nail polish that you don't want anymore for BRAND SPANKIN' NEW zoya polishes! that's right. bomb-tastic! the minimum is 6 bottles of polish, no maximum. and you can do it as many times as you want until the end date! all you pay is shipping & handling for the new bottles, $3.50 each. which if you figure the shipping costs to send them the polishes, and then if you see it as paying $3.50 per bottle w/ free shipping, you still come out way ahead. and the REAL winner is the earth! because lots of nail polish has certain chemicals in it that need to be disposed of in a different way then just throwing them in the trash, fyi. i am fully going to take advantage of this promotion, at least once before it ends and i can't wait! i've already picked out 42 colors that i want haha, so i'll probably have to narrow it down somehow. anyway, my main point is that i wanted to show you a few of my favorite zoyas over the next few weeks in case this helps anyone to pick out their new bottles. 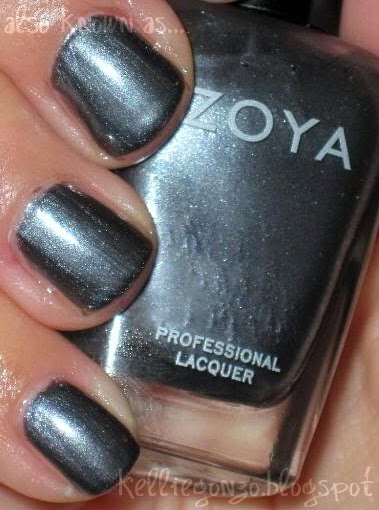 first up is zoya's freja. a marvelous charcoal frosty metallic that shimmers too. this is a manicure i did for my sister Clarrisa so no, these are not my cute petite little hands. she got all the good genes :( haha but i la la love her! this is two coats.